I have started singing in choirs as an adult in 1994 and have not stopped since. Having moved from Bordeaux to Paris to Wye (UK), to Ho Chi Minh City back to Paris and on to Bangkok, I have been lucky always to find a choir to sing in. 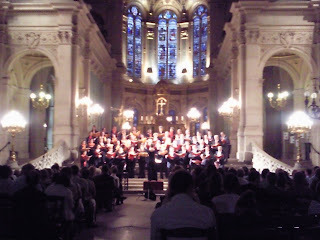 As soon as I had come back to Paris last February, I joined my former choir again: the Choeur Varenne. It is a relatively large group of 60 to 80 people, depending on the production. The bass section has a particularly beautiful round sound and with some work, the sopranos can sound really fine. The main reason why I went back to this group was that the group of singers is made of exceptionally friendly people. Every season, we have one or two week end-long rehearsals where we work hard on the pieces for the concert. But we all also bring food and drink to share pot luck. With 70 people bringing food and drink, we end up with an aperitif, salads as starters, a whole selection of quiches, a complete cheese platter and a choice of scrumptious cakes to sample. We have had two of these pot-luck meals already, each time I planned to take a photo for this blog, but each time I completely forgot because once all the food was set, we all went into aperitif mode, started drinking, nibbling and talking. So you get a blurred photo of the latest concert instead. With all this, the conductor Caroline de Beaudrap is also great. I particularly appreciate the fact that she will stop us immediately when she is not satisfied by something. This allows us to try to improve the sound immediately after having done the mistake, and hear and feel the difference: greater learning efficiency, I believe. Caroline is skilled at getting the best out of this group of mainly amateur singers. I do look forward to our next season: the complete Haendel Messiah with orchestra, to be sung end of March 2011. By the way, we are recruiting. To learn more on how you could join us, contact our conductor Caroline at cdebeaudrap@free.fr. I saw your coment on my blog, thank you for stoping by.I'm adding you to my list, for what I seen I enjoy your site. I'm a professional lyric singer and I sang the entire Messiah, and it's a wonderful piece to sing. One advice, take comfortable shoes, the maestro didn't let the choir sit during the solos and I almost died with my feet. Standing for the whole time and trying to sing while your feet are killing you it's no picknick! Thanks for the advice on good shoes for Messiah. 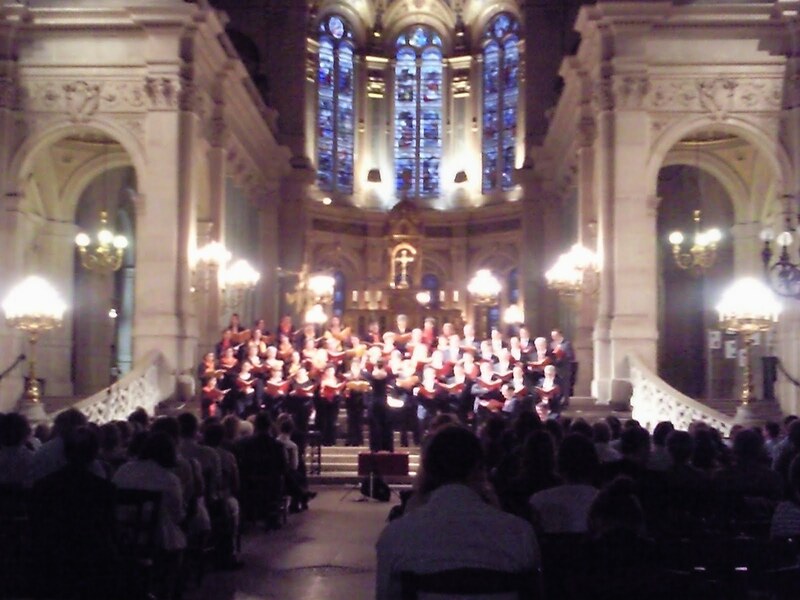 After several years of singing in British choirs where it is normal for the choir to sit during solos, I discovered to my dismay that "French choirs do not sit. Only the English do that..."
I must say it can also be quite impressive if well done when the whole choir stands together and comes in after a solo.